Nursing Home, Assisted Living and Adult Day Services All Increased 4.4% or More. The annual survey provides national, statewide, and area-specific costs for facilities offering care. This survey of 2,003 nursing homes, 1,492 assisted living communities, 1,644 home care agencies, and 1,341 adult day services in all 50 states and the District of Columbia was conducted by telephone between April and August 2011, by LifePlans Inc., for the MetLife Mature Market Institute. Costs continue to rise for those requiring long-term care in the U.S. 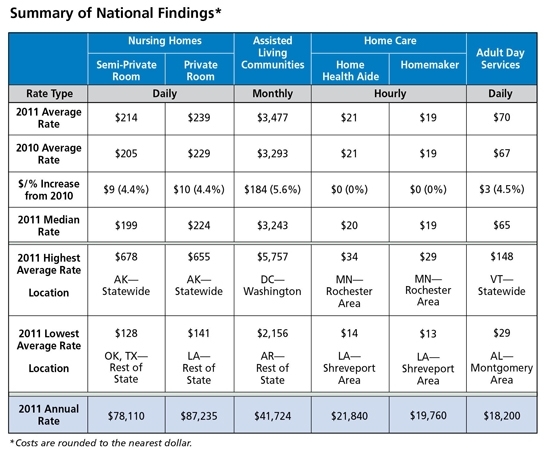 According to the newly released 2011 MetLife Market Survey of Nursing Home, Assisted Living, Adult Day Services, and Home Care Costs, conducted by the MetLife Mature Market Institute, national average rates for a private nursing home room increased 4.4% to $239 daily or $87,235 annually, in 2011. Assisted living base rates rose by 5.6% to $3,477 monthly or $41,724 annually. Adult day services went up by 4.5% to $70 per day. 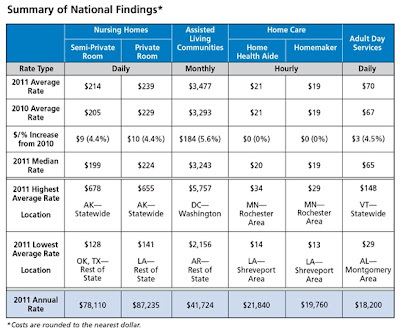 Home health aides and homemaker/companion service rates were unchanged at $21 and $19 per hour, respectively. The highest average daily rates for nursing homes continue to be in Alaska, where rates decreased slightly to $655 for a private room compared to $687 in 2010. Costs were lowest in Louisiana, outside the Baton Rouge and Shreveport Metropolitan Statistical Areas (MSA), at an average of $141 per day for a private room. For assisted living, the Washington, D.C. area had the highest average monthly base rate at $5,757, a 10% increase from last year. Arkansas, outside of the Little Rock MSA, had the lowest average monthly rate of $2,156, also an increase. “This year’s increases are greater than previous years. The state of the economy, combined with rising health care and energy costs, are having a significant impact on long-term care rates. In fact, long-term care rates continue to outpace the medical inflation rate,” said Sandra Timmermann, Ed.D., director of the MetLife Mature Market Institute. “The result is dramatic protracted inflation that will impact consumers. As the cost of care continues to rise, Americans need to discuss long-term care planning with their families now, to ensure they receive the kind of care they want in the future. This is especially critical at a time when retirement savings rates are low." The MetLife Market Survey and accompanying report provide a good deal of additional information regarding various types of long-term care available in the U.S. and a detailed breakdown of costs by region. According to the U.S. Census Bureau, in 2010, 66% of nursing home residents were women. The median age of residents was 82.7 years. Fifteen percent of nursing homes surveyed have an associated assisted living unit or wing; 11% are part of a continuing care retirement community (CCRC). A small percentage (10%) of nursing homes surveyed provide adult day services. The majority (87%) of nursing homes surveyed provide Alzheimer’s or dementia care; of those, 80% charge the same rate for care. Current estimates from the American Seniors Housing Association indicate that the average age of an assisted living resident is 86.9 years old, and the median length of stay in assisted living is 25.6 months. Oversight of assisted living communities rests primarily with state governments rather than federal regulation. In 2007, several states strengthened existing standards or implemented new standards for communities with residents with Alzheimer’s disease or other forms of dementia. Almost three-quarters (72%) of assisted living communities surveyed provide Alzheimer’s and dementia care, 50% of which charge an additional fee for the service. The majority (79%) of the home health care agencies surveyed provide Alzheimer’s training to their employees, and almost all (99%) agencies surveyed do not charge an additional fee for patients with Alzheimer’s. While most home care agencies surveyed provide an hourly rate, 81% of the agencies require a minimum number of hours per day ranging from 30 minutes to eight hours with three hours being the average. Small percentages (3%) provide a daily rate. About 32% of those surveyed have a 24-hour or live-in rate. The average daily live-in rate for a home health aide is $258 and $255 for a homemaker/companion. More than three-quarters of adult day services centers surveyed are open Monday through Friday; 6% are also open Saturdays and 13% are open seven days per week. For those open 24 hours, 67% provide full adult day services for all 24 hours. Seven in ten centers provide transportation services to and from the center. Of these, 47% do not charge a fee for these services. Of those that charge for transportation, the average one-way fee is about $8. Almost all (98%) of the centers surveyed provide services for those with Alzheimer’s disease, with 2% of these charging an additional fee. The publication can also be ordered through Contact Us on the MetLife Mature Market Institute Web site, by writing to: MetLife Mature Market Institute, 57 Greens Farms Road, Westport, CT 06880 or by e-mailing MatureMarketInstitute@metlife.com. The MetLife survey of 2,003 nursing homes, 1,492 assisted living communities, 1,644 home care agencies and 1,341 adult day services, in all 50 states and the District of Columbia, was conducted by telephone between April and August 2011, by LifePlans, Inc., for the MetLife Mature Market Institute. The states were divided into three groups, according to the population—under three million, three to 10 million and over 10 million. These groupings were determined using data from the 2000 U.S. Census and updates. The cities/areas surveyed were chosen on the basis of population and the ability to obtain a representative sampling of facilities and providers. For the “rest of state” areas, a sample of service providers or facilities were randomly selected from all providers or facilities identified in the state not already identified in the Metropolitan Statistical Area (MSA) sample. Costs for this survey were calculated for each service provider in an area and were aggregated across all providers to compute a statewide average cost. All costs are rounded to the nearest whole dollar amount. LifePlans, Inc., a risk management and consulting firm, provides data analysis and information to the health and long-term care insurance industries. The MetLife Mature Market Institute is MetLife’s center of expertise in aging, longevity and the generations and is a recognized thought leader by business, the media, opinion leaders and the public. The Institute’s groundbreaking research, insights, strategic partnerships and consumer education expand the knowledge and choices for those in, approaching or working with the mature market.